Each of our mouse pads are proudly made in the USA at our Scottsboro, Alabama facilities with sharp, colorful graphics. 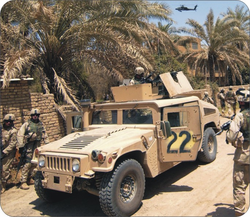 This 1st Armored Insurgent Sweep mouse pad features Soldiers from 1st Battalion, 13th Armor Regiment, 3rd Brigade, 1st Armored Division, preparing to search buildings in Taji, Iraq, where insurgents are believed to be hiding.Our Mouse Pads measure 9" in width by 7 3/4" in height and are 1/4" thick.Photo taken July 28, 2005 by Tech. Sgt. Russell Cooley IV and is courtesy of the U.S. Army.